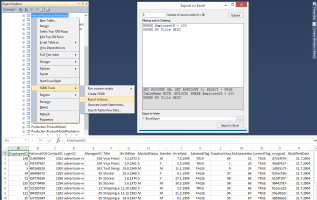 This feature does not require Excel to be installed and creates a fully functional XLSX Excel file. 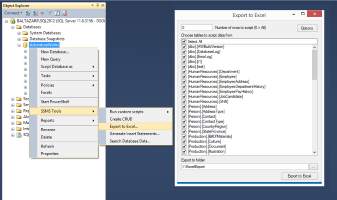 Export all result sets, one or multiple tables or a whole database to Excel. The default for maximum allowed rows per Excel file is 100000, and can be set up to 500000. If you have more rows a new file is created with _N suffix where N is the consecutive number of the file starting with 2. This way you still have the files sorted in proper data export order. Maximum number of columns is 16384. Correct data types are fully preserved, but taking into account Excel limitations. Any date before 1900-01-01 is exported as a string, others are exported normally as a date data type. Text in a cell is limited to 32767 characters. Anything longer than that will be truncated. Binary data can only be exported properly if it's 16381 bytes or less. Any blob larger than that will not be exported. Exporting the whole database creates a custom folder and an Excel file per table in that folder. Exporting result sets creates an Excel file per resultset. After result sets or a single table export completes the created file is automatically openend if you have Excel installed. Saving the best for last, the characters like newlines and tabs are fully preserved and properly exported into correct cells.